I got the idea for combination after the great results I had with the bottle hopped Flanders red (Amarillo and Cascade). In that beer the citrusy character of the hops really complimented the bright acidity and slight sweetness of the base beer. This sour/brown is pretty similar (big acidity, but still some malt, and no aggressive funkiness) I thought a hop like Citra would have the same magical effect. I also thought it would be a good way to get a sense for a hop I had never used before, still not sure what I'll do with the other 4 oz I bought (maybe a hoppy American red?). Appearance – Nearly opaque, ruddy, dark-brown. One of the problems with bottle hopping is that it makes pouring the beer more difficult (the hops tend to clog the neck of the bottle) which makes keeping the sediment at the bottom of the bottle difficult. The thin tan head has moderate retention and lacing. Smell – Nice citrus/orange nose with some tropical fruit (mango?) and pine, as well as some dank/herbal notes. The hop character has deteriorated a bit over the last few weeks (those dank notes are new), it has now been in the bottle for about 5 weeks. There is certainly a sour/funky note to the aroma, but the hops cover up the nuances. Taste – That bright/sharp acidity kicks off my first sip with a bang, but it seems mellower after that. The finish is a bit yeasty/muddy, I really need to find a better way to dry hop sours. I'm really happy with the combo of Russian River and New Belgium microbes in this one, plenty of acidity with a gentle funk. One of the sourer beers I've made, but there is a bit of sweetness to help balance it out. Not too suprising that the squash and spices are nowhere to be tasted. Mouthfeel – The acidity really puckers, but there is still some body to balance it. The carbonation is moderate (bottle hops give nucleation sights for bubbles, so I'm interested to see how the non-bottle hopped version compares). 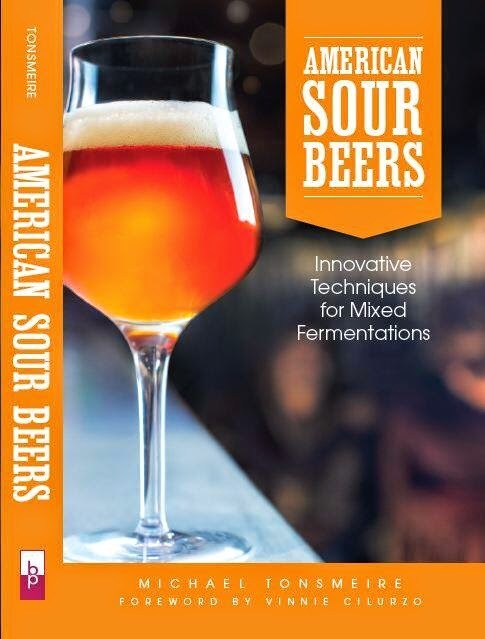 Drinkability & Notes – Tasty, but I need to be more careful pouring these bottle hopped beers to avoid getting so much yeast (I should also be quicker on the draw with these hoppy sour reviews). Looking forward to cracking open some of the "regular" version of this beer soon as well. Nice way to relax after spending my evening brewing a hoppy English ale. Nice photography - the pictures are improving. @Tom - see he has a girlfriend now, so he's not allowed to be the total pig we all know and love. I've got a couple butternut squash sitting around my closet. Was going to make soup with one, wasn't sure about the other. Does it give a strong flavor to beer? Pumpkinlike? Or is it mostly fermentable. 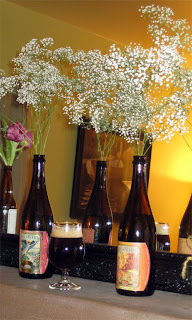 It's true, the flowers weren't my idea (although the fact that she went with beer bottles was a nice touch). Butternut squash has just about as much flavor as pumpkin, which is to say not much at all. Compared to the yeast/bacteria/malt character there isn't much squash character even in the non-dry hopped version of this beer. I used one large squash in 5 gallons, so you could certainly go up from there.